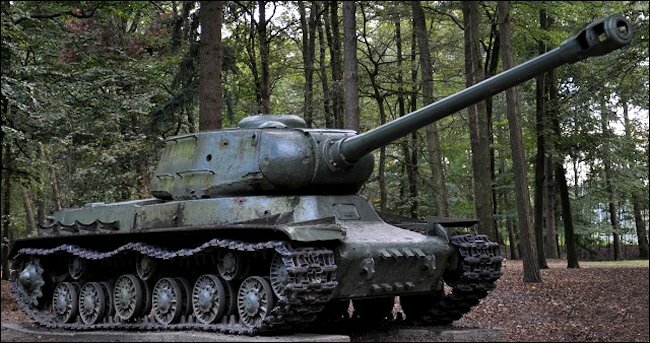 This Russian WW2 Soviet Joseph Stalin IS-2 tank can be found at the Oorlogsmuseum. Liberty Park, Overloon, Holland. The IS-2 tank looks very similar to the T34/85 but has six small road wheels and not the five large road wheels like on the T34/85. It is slightly smaller in height and does not have a hull machine gun. German Tiger tank Ace Lt. Otto Carius received intelligence that Russian tanks had been spotted in a nearby Latvian village just outside Dünaburg. On 22nd July 1944 the 2nd Company Heavy tank Battalion 502 was in the only tank battalion of the German Army Group North covering a front of 800km. The German Army had been reduced in strength by 50% through continual fighting on the Eastern Front over the last two years. They were outnumbered by the Russians in man power and equipment. Otto rounded up eight Panzer Mark VI Tiger tanks and moved out. He came up with a daring plan. "We were completely on our own. Somewhere in the valley there were some Russian tanks. The village was called Malinava. It would be too dangerous for us to attack in line. We had to get through this without losses if at all possible." "Two Tigers would drive through the village at high speed and surprise Ivan. He must not be allowed to fire a shot. I will lead and both of us will advance to the centre of the village as fast as possible. Each of us knew at that point that speed was decisive. I rushed passed two Russian T34/85 tanks at the front of the village. My comrade Albert Kersher, in the second Tiger tank noticed that their turrets were moving to follow me. He immediately stopped just in front of them, fired and knocked them both out." "Kersher radioed and pointed to the right. We were startled for a moment. We thought we had a King Tiger in front of us that had been captured by the Russians." What Otto was looking at was the Russian Army’s new killing machine. A monster main battle tank that was designed to smash Tiger tanks. It was the Joseph Stalin IS-2 tank. It had 120mm of protective front sloping armour and had an impressive 122mm main cannon that was powerful enough to penetrate a Tiger tank’s armour. "After I initially hesitated I fired at close range into its flank and the tank burst into flames." At the edge of the village Carius and Kersher surprised a unit of IS-2 tanks at lined up in a rest area. The two Germans had only minutes before the Soviet crews reached their tanks. They started firing at the stationary Russian tanks, methodically destroying them one at a time. Some of the crews managed to get into their tanks and fire back. This is when a design fault was noticed by the Germans. Because the 122mm gun was so big the Russian gunner had to depress the gun all the way down to enable it to be loaded and then raise the gun back up to find its target again. This meant that the IS-2 tank had a poor rate of fire which proved to be a very critical negative ability in a tank battle. The slow loading IS-2 Russian tanks could not compete with the rapid firing Tiger Tanks. "Only two Russian tanks tried to flee to the east. None of the others found any opportunity to move." This tank on tank action was all over in less than twenty minutes. Carius and Kersher had managed to destroy 18 of the new Soviet Joseph Stalin IS2 tanks and two T34/85 tanks. But what do Soviet records say? On 22nd July 1944 our 41st Tank Brigade (T-34 tanks) and the 10th Tank Regiment (IS-2) of the 5 Tank Corps were in that area. Archival Soviet army repots and documents for that day vary in recording battle damage but the figures showed that between 5-18 tanks were knocked out by German artillery bombardment and air strikes. These broke down to 10-13 T34/85 and 5 IS-2 heavy tanks. There was no mention of Tiger tanks near the village. The Russian response to German Tiger tank Ace Lt. Otto Carius claims is that he came to the village after the destruction. Having observed all the knocked out tanks he recorded the kills as a victory for his battle group. The Russians are calling him a liar. Where can I see more IS-2 Tanks?